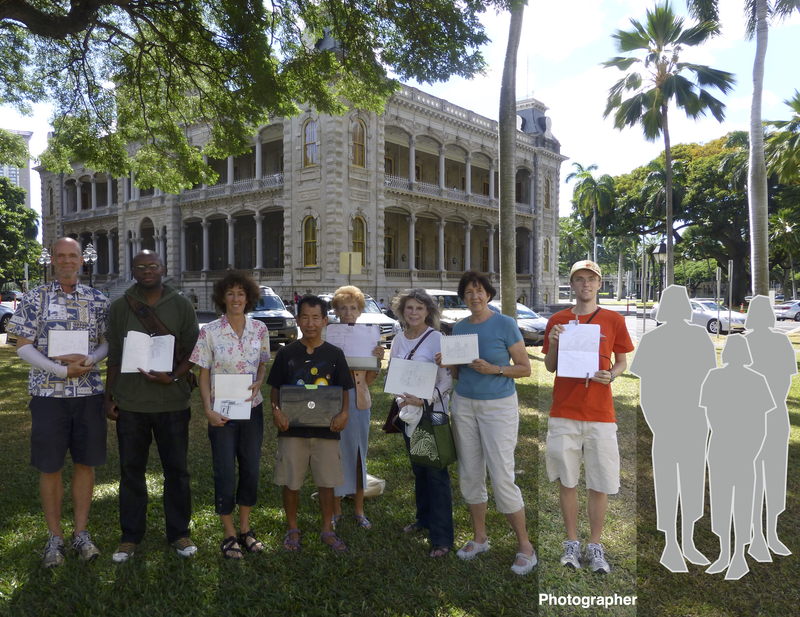 Today’s sketch event took us back to one of our favorite locations, the lawn of ʻIolani Palace, from where (in addition to the obvious attraction) many other sketch-worthy sights are a short stroll away, among them the King Kamehameha Statue, the State Public Library, and the State Capitol. Ample shade was an additional asset on a clear day that brought together sketchers from Oʻahu, Minneapolis, and Germany. Show-and-tell saw an even wider range of styles and techniques than usual, together with subjects that spanned the gamut from vignettes to sweeping views of the historic buildings around us. We ended the morning sharing stories about USk symposiums and favorite sketch materials. ‘Iolani Palace is a popular subject for sketchers, but rarely do we get to venture inside with pencil and paper. Today’s opportunity to do so, thanks to the support and hospitality of the Friends of ‘Iolani Palace, was thus greatly appreciated, as was the fascinating tour by docent educator Zita Cup Choy. With exterior views being just as tempting on a beautiful day, time was too short for most of us to cover even a fraction of the many irresistible sights. Yet again, the verdict is: we will be back! Join us on November 26th at Hawai‘i State Public Library for the next event. And, as always, don’t forget to check out our sketches on Flickr and upload your own!